Below is an excerpt from A Life of Lessons by Jane Kelly. Photos by Sanjay Suchak. Ben Williams was 4 when he entered Nevada's foster care system with his 1-year-old brother, Andre. Sons of a prostitute addicted to drugs, the toddlers became wards of the state. A life of heartache and abuse lay ahead. 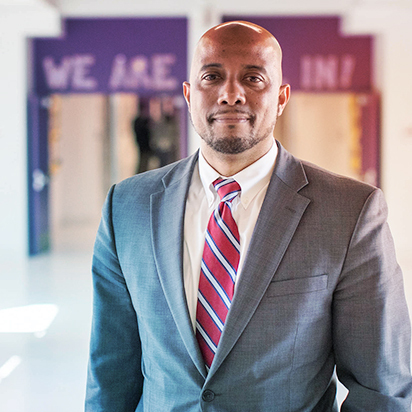 Thirty-three years later, Williams is the role-model principal at Ron Brown College Preparatory High School in northeast Washington, D.C., and the holder of three degrees from the University of Virginia. Those difficult, early years seem to have predestined him for the responsibility and are probably why he so easily relates to the students at the new, public, all-male, college preparatory high school, the only such academy in the nation's capital and one of just a few in the country. Like Williams, some of the young men at Brown College Prep have seen hardship. They've experienced trauma. Some were dealt a bad hand. But they persevere. "I wanted to really address young people who have struggled, experienced trauma, are foster care students and students who have been adopted; to give them a space they can work in, be encouraged and feel loved while pursuing their academic dreams," Williams said. "I feel like teachers and administrators did that for me when I was growing up; they were the consistent presence. I wanted to help young people who have experienced life the way that my brother and I did, but also be a role model for all young people." In 2005, Ben Williams earned a master's degree in teaching from the Curry School of Education and completed his doctorate in education and administration 10 years later. "Placing the doctoral hood on Ben's broad shoulders is one of the highlights of my academic life," said Williams' doctoral advisor, Curry Professor Dan Duke. "Some who have made great strides, like Ben, become arrogant or self-absorbed. Not Ben. He remains a 'gentleman and a scholar,' as my dad used to say. That was his highest praise." Williams still holds a deep affection for Duke and they remain in touch. "He believed in me when many other people didn't. I have high regard for him because he reminds me of my father in so many different ways," he said. "He was one of those people I could not take an unfinished product to. I am thankful and grateful that he continues to believe in me." In August 2016, the District of Columbia Public Schools opened the doors of Ron Brown College Preparatory High School to 100 ninth-grade young men. Williams is the founding principal of the gleaming school, built in 1930 and undergoing a $58 million renovation. The D.C. system said the 48 percent graduation rate of African-American and Latino males mandated they address the problem directly, and the school, which is just off the Anacostia Freeway in Deanwood, was established. The current class is mostly African-American; a new ninth-grade class will be added over each of the next three years to complete the Ron Brown School's transition to a four-year institution. Each school day starts with a morning community circle, a time when students and teachers can offer "shout-outs" to one another. "Too often in our community, our young men of color try to put each other down," Williams said. "We want to shift their mindsets to really uplift each other, because it is a reflection of who we are as a school." The "circle" is actually a rectangle of chairs in a large central room, sparse but for posters of Langston Hughes, Carter G. Woodson, Frederick Douglass and Thurgood Marshall. As the minutes pass, the room gradually fills. In addition to shout-outs,the half-hour serves as a buffer, allowing students to get to their first-period classes on time. "Generally speaking, our young people have some issues getting to school on time because we are a city-wide school and many travel far distances to get here," Williams said. "Some are basically serving as the adults in their households, so they have to take siblings to school, they have to make sure that those siblings get up. We have to meet students where they are and try to make adjustments to make sure they are able to not only fulfill their responsibilities to their families, but to be able to get to school, because the majority of them want to be here." The school, named for President Bill Clinton's African-American commerce secretary, who died in a plane crash in 1996, has an 83 percent daily attendance rate, among the highest in the district. The school's slogan is "We are all in," and that is set in motion each day at morning circle. For the full story about Ben Williams, visit A Life of Lessons published in UVAToday's Illimitable. Our alumni are a critical partner in our goal of bringing transformative change for good. Visit our Alumni page.